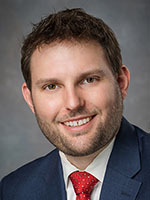 Dr. Duell earned his medical degree at Tufts University School of Medicine and completed his Internal Medicine residency training at Tufts Medical Center. He completed a Cardiovascular Disease fellowship and a fellowship in Clinical Cardiac Electrophysiology at the University of Maryland Medical Center. He has advanced training in the diagnosis and treatment of abnormal heart rhythms (arrhythmias), cardiac ablations, and device (pacemaker/defibrillator) implantation and extraction. Board certified by the American Board of Internal Medicine, Dr. Duell is a member of American Society of Cardiology and the Heart Rhythm Society. He has published several articles on heart disease and arrhythmias in journals including Current Cardiology Reports and the Journal of Nuclear Medicine. Additionally, he has contributed chapters to the upcoming books Atlas of Cardiac Innervation and Cardiac Mapping.